Symptom: Machine shuts down when flippers are activated. Many people are familiar with the Williams flipper reset problem. I’ve written about reset issues in the past. This is the first time I’ve come across an EM that shuts down due to the flippers being activated. Usually when a pinball machine shuts down due to the flippers, there is a high-resistance path in the power chain. An EM is no different in this regard. So, the first place I looked was the fuse holder. Bally EM machines from the 1970’s are known for having bad fuse holders. As soon as I touched the fuse the machine came back to life. 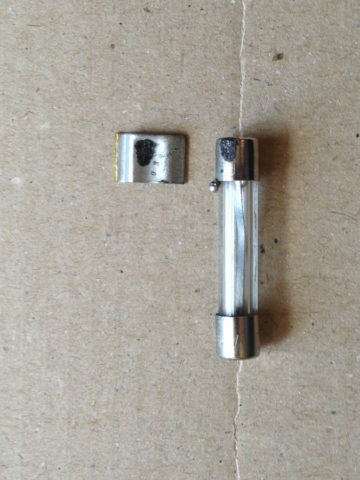 Burned fuse and fuse holder. In this case the fuse wasn’t making a solid connection to the fuse holder for a long time (years). The melted solder blob on the side of the fuse end cap is indicative of high temperatures, caused by the high resistance connection to the fuse clip. Plus there was the black scorch mark on both the fuse and the clip. With the high temperatures, the fuse clip turns from being springy to being brittle. It broke off the fuse holder when I tried to remove the fuse. The fuse holder was replaced and a new fuse installed. This was quick to diagnose and quick to repair.